For thousands of years, most seawater pearls were retrieved by divers working in the Indian Ocean, in areas like the Persian Gulf, the Red Sea, and in the Gulf of Mannar. 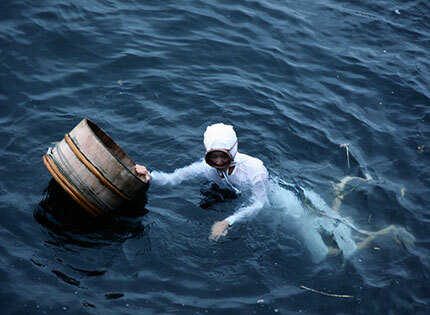 Starting in the Han Dynasty (206 BC–220 AD), the Chinese hunted extensively for seawater pearls in the South China Sea. 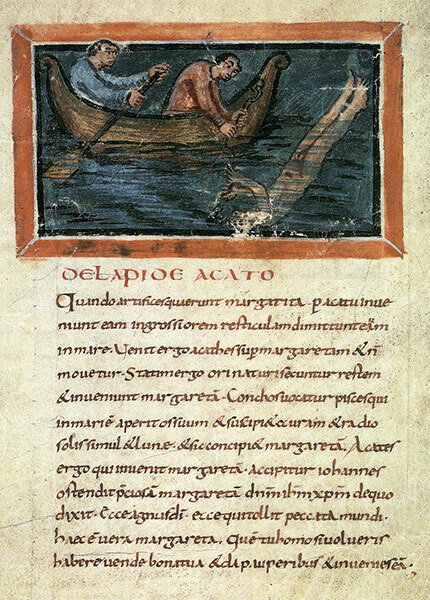 In the 14th-century Arabian Sea, the traveller Ibn Battuta provided the earliest known description of pearl diving by means of attaching a cord to the diver's waist. When Spanish conquistadors arrived in the Western Hemisphere, they discovered that around the islands of Cubagua and Margarita, some 200 km north of the Venezuelan coast, was an extensive pearl bed (a bed of pearl oysters). One discovered and named pearl, La Peregrina pearl, was offered to the Spanish queen. According to Garcilasso de la Vega, who says that he saw La Peregrina at Seville in 1507, (Garcilasso, "Historie des Incas, Rois du Perou," Amsterdam, 1704, Vol. II, P. 352.) this was found at Panama in 1560 by a slave worker who was rewarded with his liberty, and his owner with the office of alcalde of Panama. Margarita pearls are extremely difficult to find today and are known for their unique yellowish color. The most famous Margarita necklace that any one can see today is the one that then Venezuelan President Romulo Betancourt gave to Jacqueline Kennedy when she and her husband, President John F. Kennedy paid an official visit to Venezuela. This darker variety of South Sea pearl is cultured on the beautiful islands of Tahiti in French Polynesia. 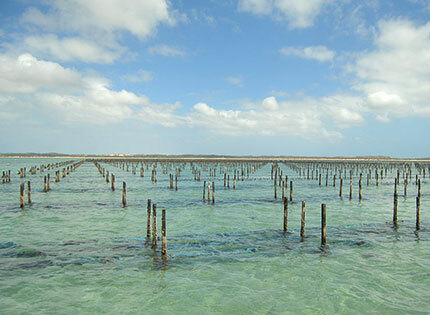 These pearls are produced by the “Pinctada margaritifera’” or “Black Lip Oyster”. Tahitian pearls prices are determined by their luster, color, shape, size, nacre thickness and beauty. Their color ranges from light to very dark gray, but they are also produced in natural fancy colors like green, pink, lavender, blue and brown. For centuries, the beauty of Akoya pearls has enchanted the world. This is the most traditional of pearls. Originally produced only in Japan, they have recently begun producing these pearls in Vietnam & China. Akoya pearls come from “Pinctada Martensii” or “Akoya” oysters, which are usually cultured. These pearls have natural colors that range from light pink to white to yellowish. Akoya pearls are known for their high luster and rich color. White South Sea pearls are valued for their brilliant luster and large size. Cultured White South Sea pearls are produced by one of the largest pearl-bearing oysters, the Pinctada Maxima oyster, along the coasts of Australia, Indonesia, and the Philippines. The oyster which produces White South Sea pearls, commonly known as the Silver-Lipped Oyster, can grow to the size of a dinner plate but it is highly sensitive to the culturing process. This is one of several factors which contribute to the cost and rarity of South Sea Pearls. Another factor is the time it takes to culture South Sea Pearls. It typically takes 1-4 years to culture a South Sea pearl, while, in comparison, Freshwater pearls can be produced in 1–12 months. It can take many years to collect pearls from several harvests, in order to create just one of the magnificent strands you can find at The Pearl Exchange. Golden South Sea pearls are valued for their brilliant luster, large size and rarity. Cultured Golden South Sea pearls are produced by one of the largest pearl-bearing oysters, the Pinctada Maxima oyster, along the coasts of Australia, Indonesia, and the Philippines. The oyster which produces White South Sea pearls, commonly known as the Gold-Lipped Oyster, can grow to the size of a dinner plate but it is highly sensitive to the culturing process. This is one of several factors which contribute to the cost and rarity of South Sea Pearls. Another factor is the time it takes to culture South Sea Pearls. It typically takes 1-4 years to culture a South Sea pearl, while, in comparison, Freshwater pearls can be produced in 1–12 months. It can take many years to collect pearls from several harvests, in order to create just one of the magnificent strands you can find at The Pearl Exchange. Freshwater pearls are primarily cultured using the “Hyriopsis cumingii”, or “Triangle shell” pearl mussel. Freshwater pearls are arguably the most diverse type of pearls produced today. They grow in a huge variety of shapes, a broad range of sizes, and have a natural pastel color palate that ranges from dark purple, to light pink and white. The majority of Freshwater pearls are produced in China, with limited production in Japan. Luster is widely considered the most important factor in judging a pearls quality. It is the term used to describe the reflectivity of the pearls surface. The higher the pearls luster is, the more it shines, reflecting light and objects more clearly. For a pearl to have a deep mirror-like reflection, it must have a very smooth surface created by many even layers of nacre. Saltwater pearls generally have higher luster than freshwater pearls. Pearls with low luster appear dull or chalky white, instead of brilliant and shiny. The second most important indication of a pearl’s value is the thickness of coating. A pearl is made up of layers and layers of a substance called nacre – calcium carbonate and protein. The thicker the nacre is, the more durable and valuable the pearl. The average thickness of a pearl’s nacre ranges from 1mm to 3mm. Coating cannot be easily judged by an unpracticed eye, but can be determined by how long a pearl has been underwater. Generally, as the size of the pearl goes up, the value goes up as well (all other factors being equal.) The standard way pearl sizes are measured is in millimeters (mm). Pearl sizes can range from 1mm (or even less for some seed pearls) up to as large as 20mm for large South Sea Pearls. Large sized pearls are rare, and size has a significant effect on price. A difference of one millimeter can raise the price by a 100 to 200 per cent in the pearl industry. 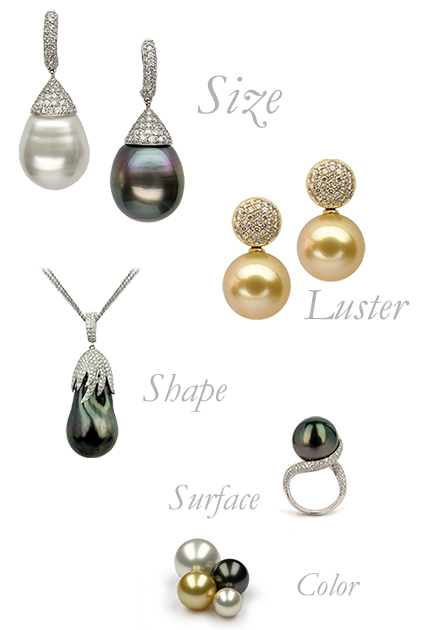 Below is a list of the most common size ranges for the different types of cultured pearls. Round - Perfectly round pearls are the most sought after and the rarest of cultured pearls. Because of their rarity and "classic pearl" appeal, they are typically the most highly valued of the pearl shapes. Generally all pearls are nucleated with a round bead in the hopes of culturing a round pearl, but only 5-10% of a pearl farm's harvest will actually result in a pearl that can be qualified as round. Near-Round - To the untrained eye, near-round pearls have the appearance of being perfectly round pearls, even more so when worn on in a necklace. If the pearls are not perfectly round but very close to round they are considered “near-round” or sometimes called “off-round”. The majority of freshwater pearls on the market will fall into this category. Button – Button pearls are symmetrical in shape and have a round appearance from the front, with the opposite side being flat. While noticeable when strung as a strand, their button shape can appear as round when set as studs or cufflinks, and are considerably less expensive than round pearls. Oval – Oval pearls are symmetrical but not perfectly spherical. Oval pearls have the appearance of an elongated round pearl and are considerably less expensive than round pearls. Oval pearls have their widest diameter found at the center of the pearl. Drop – Drop pearls are symmetrical in shape and have a tear-drop appearance. They are similar to ovals but have one end noticeably thinner than the other, sometimes coming to a distinct point. A pearl that has a perfect "pear-shape" can be very valuable, especially in larger sizes, and may even fetch higher prices than rounds. Baroque – Baroque pearls are non-symmetrical and have no specific shape designations except for the fact that their shape is irregular. Their shapes can vary from off-round to pebble-shaped to irregular drop shapes. The demand for baroque pearls has steadily increased as more and more consumers and designers gain appreciation for the wide range of unique shapes found in baroque pearls. Circle - Circle pearls can have a variety of different shapes including baroque, drop, button and near-round. The defining characteristic that designates a pearl as circle is the presence of visible concentric “circles” or “rings” around the diameter of the pearl. Circle pearls are most often found in South Sea and Tahitian Pearls, and are gaining popularity due to their unique appearance and affordability. Pearls are the only organically created gem. Because they are produced by a living creature, tiny surface imperfections are almost always present. The fewer and smaller these imperfections, to more valuable the pearl will be. The size of the pearl should also be taken into account when examining surface blemishes. A larger pearls value will be less affected by small imperfections. Blemish location can also be a factor because if the imperfections are concentrated in one area they won’t be as noticeable as blemishes that are spread out over the pearls surface. Blemishes are also less noticeable if the pearl has high luster. Pearls come in a wide variety of natural colors. Basic colors include cream, white, gray, green and pink. A pearls color does not affect its value or quality grade as much as other factors. The most important aspects of a pearls color, in relation to judging its quality, are the saturation and even distribution of its color. While color demand is primarily based on personal preference, rare and intense fancy colors are often sold at a premium. 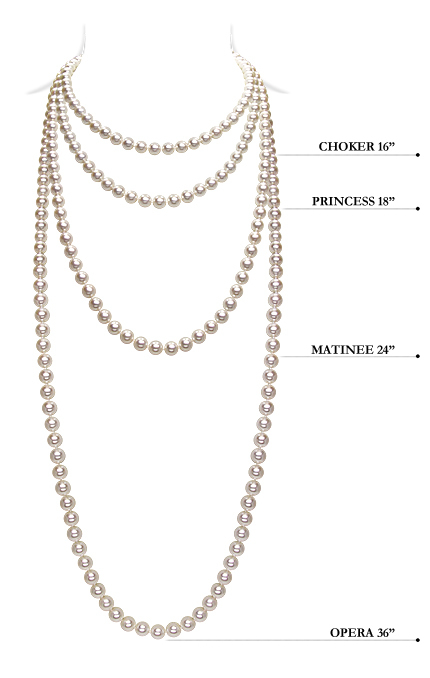 Lengths of Pearl necklaces: There is a special vocabulary used to describe the length of pearl necklaces. While most other necklaces are simply referred to by their physical measurement, pearl necklaces are named by how low they hang when worn around the neck. A collar, measuring 10 to 13 inches or 25 to 33 cm in length, sits directly against the throat and does not hang down the neck at all; collars are often made up of multiple strands of pearls. Pearl chokers, measuring 14 to 16 inches or 35 to 41 cm in length, nestle just at the base of the neck. A strand called a princess length, measuring 17 to 19 inches or 43 to 48 cm in length, comes down to or just below the collarbone. A matinee length, measuring 20 to 24 inches or 50 to 60 cm in length, falls just above the breasts. An opera length, measuring 28 to 35 inches or 70 to 90 cm in length, will be long enough to reach the breastbone or sternum of the wearer; and longer still, a pearl rope, measuring more than 45 inches or 115 cm in length, is any length that falls down farther than an opera. Indeed the radiance and beauty of a genuine quality pearl can be preserved lifelong with a bit of care. Being formed naturally, with layers of predominantly calcium based minerals; pearls are susceptible to both acidic and alkaline chemicals. Therefore, pearls should never be washed with strong soap or detergent solutions. Pearls can be worn frequently, and with the following precautions, preserve their beauty forever. Wearing Pearl Jewelry: Pearls should be put on last while dressing up, and taken off first when dressing down. This is to prevent the harmful effects perfumes and cosmetics have on pearls. It’s a good idea to put your pearls on at least 30-minutes after you’ve put on perfumes or cosmetics. Keeping Pearl Jewelry: While safe keeping, prevent pearls coming in direct contact with other hard precious stones such as diamonds, etc. It is a good idea to store pearls wrapped in a soft cloth. Cleaning Pearl Jewelry: Tenderly wipe off pearls with a soft cloth every time after wearing. Occasional cleaning with warm water and a touch of alcohol or a very dilute soap solution is recommended. After cleaning the pearls individually with a soft cloth moistened with this solution, wipe the pearls off with a soft cloth dampened with clean water. Finally, dry the pearls with a soft cloth before storing. Re-stringing Pearl Necklaces: If you wear your pearl necklace on a regular basis, you should have it professionally re-strung about once a year to ensure all the pearls are secure. The necklace should be strung with knots between each pearl to safeguard against all of the pearls falling off should the necklace thread break. The knots also protect the pearls from rubbing against each other and wearing down the nacre coating. It is a good idea to occasionally inspect your necklace for any weak spots in the thread or fraying.